After reading this article you will discover that education throughout the world is slightly different. Although we all learn similar things, the learning path varies depending on multiple cultural, social or demographic factors. Hence, international education is very beneficial as it aims to establish bridges and links between different education systems to enrich the lives of students who opt for this modality. In Australia, the School of the Air relays lessons by radio signals to distant students who live in remote areas. The largest school in the world is in India. It is called City Montessori School and has more than 32,000 students. Its name derives from the Italian educator Maria Montessori who laid the foundations for an alternative education method that is based on fostering in the student an integral development. China is the country where children receive the most homework. Teenagers in Shanghai spend an average of 14 hours a week doing their homework. 4. Children living in Pakistan do not have a legal right to a free education and compulsory education is only imposed on children from five to nine years old. Summer vacations last from mid-December to early March in Chile, giving the children three months of vacation. The country with the shortest school year and the longest school day is France. Children in Germany receive a gift at the beginning of the course. It is called Schultüte and it is a cone that is full of pens, pencils, mini books, sandwiches and other gifts as a welcome to the new course. Children in Holland start school on their fourth birthday, so there is always someone new in the class. England is the home of the oldest boarding school in the world: The King’s School in Canterbury, which, despite having been established in 1567, offers a modern, complete education, with up-to-date quality equipment and supplies. Even if it’s a weekend or a holiday, Russian children always start school on the “Knowledge Day”, which is September 1st. The smallest school in the world is in Turin, Italy and has only one student. Males and females are educated separately in Iran until they reach college. Even teachers must be of the same gender as the classes they teach. In Kenya, it is not mandatory for children to go to school, but most do. 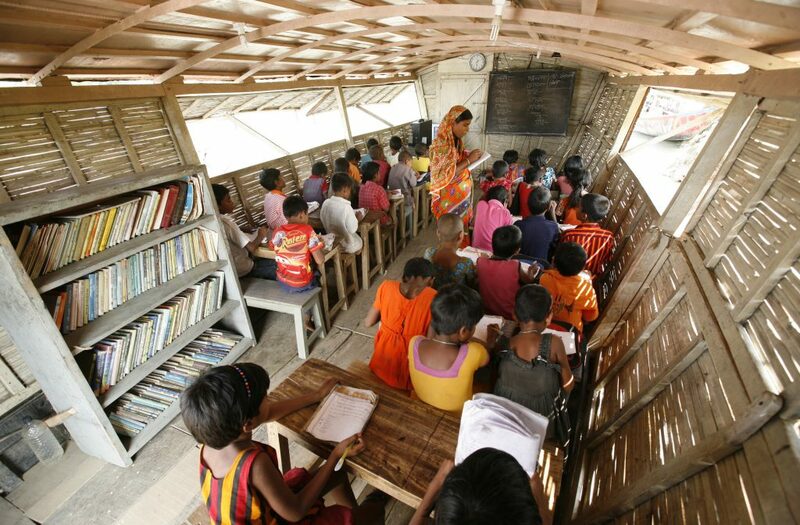 Due to the flood problems facing the country, Bangladesh has no less than 100 boat schools. Each one has access to the internet, a library and works with solar energy. One of the subjects taught in Icelandic schools is weaving. It is safe to say that education is imparted in unique ways and places around the world, and wherever you go you will find children learning and developing in very different but not necessarily less effective ways.